The restaurant of the mountain hut is open to everyone, both for lunch and dinner (the latter only upon reservation) offering, with its large windows, a beautiful view over the surrounding mountains. The large dining room is ideal for gatherings and banquets with the possibility of a tailor made menu. The family is personally in charge of food preparation and pays special attention in enhancing the products of the territory. Thanks to the mountain hut location, the family has the opportunity to draw from the gastronomic tradition of both Val Brembana and Valtellina. The à la carte menu offers platters of local cold cuts and cheese; fresh home-made pasta, Casoncelli alla Bergamasca, Pizzoccheri from Valtellina, pasta stuffed with wild herbs; second courses such as: roasts, braised and game are always accompanied by polenta, simple or Taragna. 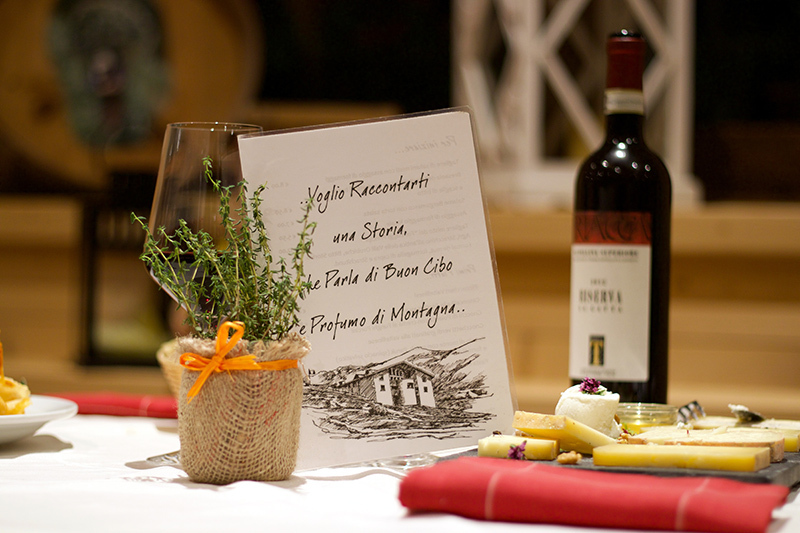 The menu offers a wide range of local cheese: “Storico Ribelle”, “Formai de Mut”, mascherpa (ricotta from the pasture) and goat cheese; from the nearby valleys: “Taleggio” and “Strachitund”. For the sweet tooth delicious homemade cakes such as nuts and caramel cake, buckwheat flour with blueberry cake,”mascherpa” cheese and chocolate cake and many more. To accompany the dishes with a good glass of wine, the mountain hut cellar offers several labels from Valtellina and beyond. Book a dinner at the hut!